Eggs were originally pagan symbols of fertility. In ancient Egyptian and Persian cultures, eggs were decorated and exchanged during the Spring equinox. The Romans, Gauls, Chinese, Egyptians and Persians of ancient times all cherished the egg as a symbol of the renewing universe. Christians later used the imagery of the egg to illustrate not nature’s rebirth, but the rebirth of of humanity through the sacrifice of Christ. Christians embraced the egg symbol and likened it to the tomb from which Christ rose. Old Polish legends which blended folklore and Christian beliefs reinforced the association between Easter and eggs. One legend concerned the Mary, the mother of Jesus, who was believed to have given eggs to the soldiers at the cross. According to tradition, she wept and entreated the soldiers to have mercy, and her tears fell upon the eggs, spotting them with dots of brilliant color. Another Polish legend relates to Mary Magdalene’s visit to the tomb. According to that legend, she went to anoint the body of Jesus, taking with her basket of eggs to serve as a repast. When she arrived at the sepulchre and uncovered the eggs, the pure white shells had miraculously turned a multitude of colors. Decorating and dyeing eggs for Easter began in England during the Middle Ages. Christians often dyed their eggs red to symbolize the blood of Christ. Colored eggs were also exchanged as romantic gestures between lovers. During the Medieval period, were given by masters to their servants at Easter. The household accounts of Edward I in 1290 recorded a lavish expenditure of eighteen pence for four hundred and fifty eggs, which were painted in gold leaf and colored for Easter gifts. During the reign of Edward I of England, members of the royal household exchanged gifts of dyed, gilded Easter eggs. In Germany and other countries, eggs were hollowed out, dyed, and hung from shrubs and trees during the Easter Week. Perhaps the most famed Easter eggs were those made by the well-known goldsmith, Peter Carl Faberge. In 1883, the Russian Czar, Alexander, commissioned Faberge to make a special Easter gift for his wife, the Empress Marie. This first Faberge egg had an outside shell of platinum and white enamel, and opened to reveal a smaller gold egg which in turn displayed a golden chicken and a jeweled replica of the Imperial crown. The egg so delighted the Czarina that the Czar promptly ordered Faberge to design similar eggs every Easter. In later years, Nicholas II continued his father’s custom. The Resurrection Egg was created between 1885 and 1890, and became one of Faberge’s most beloved masterpieces. The egg is exquisitely crafted in the style of the Italian Renaissance and depicts Christ rising from the grave. The Easter egg hunt and egg rolling can be traced to the Roman practice of running races on an oval track and giving eggs as prizes on Easter day. Easter egg hunts were traditionally held on the Saturday before the Holy Week. In England, Germany and other European countries, children rolled eggs down hills on Easter morning, a game which has been connected to the rolling away of the rock from Jesus Christ’s tomb after His resurrection. British settlers brought this custom to the New World. In 1810, Dolly Madison, the wife of the fourth American President, organized an egg roll in Washington, D.C. on the hilly lawn of the new Capitol building. The custom continued, except during the Civil War. In 1880, the First Lady invited children to the White House for the Egg Roll, after officials complained that they trampled the Capitol lawn. The tradition has endured to the present day, and the Monday after Easter is the only day of the year when tourists are allowed to wander over the White House lawn. As for the tradition of the Easter bunny, the rabbit served as a symbol of the goddess Eastre and also represented fertility. Early Christians used the rabbit as a metaphor for Christ’s post-resurrection appearances. As the rabbit’s movements were quick and elusive, so Jesus was seen by his disciples, disappeared, and then seen by others. The analogy was somewhat of a stretch but used nonetheless in evangelistic efforts. The modern Easter Bunny was first popularized in Germany in the 16th century and brought to the United States during the Victorian era. Rabbits were very popular images in Victorian Easter scrap art and cards. Since then, the celebration of Easter has become increasingly secular, with the holiday becoming largely associated with the image of a rabbit in Springtime. Easter parades originated from Emperor Constantine’s decree that every citizen wear his or her best clothing to observe the Holy Day of Easter. Early Christians believed that the week before Easter was a special time to be baptized, and called it ‘White Week.’ Those who were newly baptized wore white robes in public as an outward expression of their inward transformation. Christians who had been baptized earlier wore new clothes during Easter week, and Europeans came to believe that new garments worn on Easter Sunday would bring good tidings for the year. The first public Easter parade in America occurred in 1860 in Atlantic City, New Jersey, when families strolled along the Boardwalk in their new Spring finery after the Sunday service. The tradition continued, with the most famous today being the Easter Parade along Fifth Avenue in New York City. Finally, white lilies have become associated with the celebration of the holiday, so much so that they have been given the name of “Easter lily.” Easter lilies bloom in the Spring, and their white color symbolizes purity, virtue, and new life in Christ. The beautiful, trumpet-shaped white flower has also been named the “Passion flower,” for the passion of Christ. In fact, the lily was referred to by Christ in the Sermon on the Mount, when He told his listeners: “Consider the lilies of the field, how they grow: they toil not, neither do they spin; and yet… Solomon in all his glory was not arrayed like one of these.” Often called the “white-robed apostles of hope,” lilies were also found in the Garden of Gethsemane, where Christ prayed for strength before His crucifixion. According to tradition, white lilies sprung up where drops of Christ’s sweat fell to the ground in his final hours of sorrow and distress. The pure white lily has also been associated with the Virgin Mary; one legend relates that when the Virgin Mary’s tomb was visited three days after her burial, it was found empty except for blooms of majestic white lilies. Native to the Ryukyu Islands of southern Japan, and the islands of Okinawa, Amani and Erabu, these delicate blooms were introduced to England in 1819, and brought to America during the late 1880s from Bermuda. 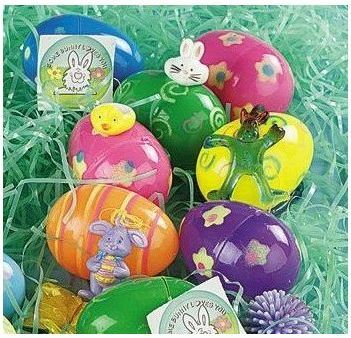 This entry was posted in Crafts ~ DIY ~ Projects, ~Easter and tagged easter, Easter Bunny, Easter egg, Jesus, Religion and Spirituality, United States. Bookmark the permalink.